A joyous #zutaramonth to everyone! 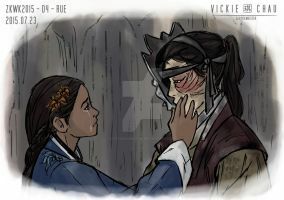 No problem I'm a zutara lover 4 live!!!! Thank you for your kindest comment! Wow, another outstanding piece! I love all those colours, and how you keep discovering new scenes in the pic. It's like they allow you a glimpse in their world as they look into those fireplaces. That's wonderful. I'm glad you told us to keep looking, wonderful discoveries to be found! Truth be told, I could never see through those 2D-images-gone-3D that you mention Hard as I tried, it just never seemed to work (but never failed to deliver a headache in its wake argh ) - so that's probably why I decided to paint these illusions myself Or may be not, but the comparison you bring up is really great! Because I'm truly touched to hear my art can work this way too! Oh, I spent my whole childhood wondering what the heck those people (dad included) saw in those chaotic swirls. But it wasn't until my teens that I studied the matter more deeply, and I learnt that I had to focus my vision beyond the painting, and then the vision would slowly adjust to see the 3D image (because, you know, if your eyes focus beyond an object, you'll see that object "doubled", and I think it was the whole point of the thing: in the painting were somehow hidden two slightly different versions/views of the same pic, then each eye would see one of those views, and the brain would elaborate them as an actual 3D object. Ok, enough with the OT. ). ...Who knows, maybe it's truly some sort of kekkei genkai that activates at some point in your life. Well, your version of the magic is even more fascinating though, since you don't need strange ocular tricks nor headaches in the process of enjoying the picture! ^^ Everything is there from the beginning, but you just can't see it at a first glance... really, it's amazing. So best of luck with your Fellowship finally gathering for a good watch! Mmh, I'm more and more curious about that film... can't wait to finally have the chance to watch, so then we can finally discuss!!! Yeah, OTGW and Kubo might be veeery different, but I perfectly get what you mean. Stay tuned, I want to fix this as soon as possible! If anyone would get the similarity between the two, it certainly gotta be you, dear So sure thing I'm staying tuned, yup! I can imagine it took a ton of time for doing it.. Thank you for your praise!